Aeroweenie: LG Course Aero Road Helmet Stealth Aero! 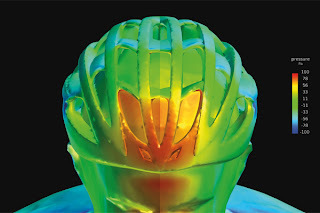 Aero road helmets are all the rage, and previously we covered the slick Giro Air Attack. Some riders, however, are unwilling to defy fashion trends, or are worried about the Texas heat in a helmet with so little ventilation. 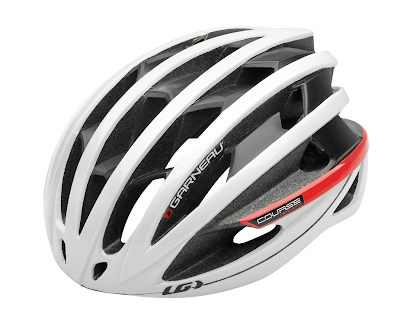 The LG Course aero road helmet comes to the rescue! Based on appearance alone, it's hard to believe the Course could be as aero as Louis Garneau claims in their white paper, given that it looks very much like a normal road helmet. But some very good aero testing results have been coming in from ERO Sports. The helmet has tested fast on multiple riders; they report it consistently tested about 2% less drag (over the entire rider-bike system) than the Air Attack, and never slower. This included both aero positions and road bike positions. So we decided to check the helmet out. We picked up a size Medium from ATC, and on close inspection you can see the trick with this helmet seems to be that it is basically letting the air pass straight through over your head and out the back again. Interestingly, this seems to make ventilation better than most normal road helmets, as both my wife and I noticed we could feel the breeze through our hair more with this helmet as compared to our usual ones. This, combined with carefully controlled frontal area, probably explains the surprising aero goodness. At 250g, the weight is also low, and it fits us both very comfortably. 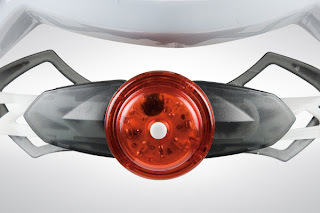 A really neat bonus feature is an included rear light that velcros onto the back of the helmet. So we have a helmet that is light, aero, ventilated, and includes integrated safety features, but is there any catch? It is a bit more expensive than the Giro Air Attack and doesn't have the cool shield feature as an option. Also, both the white paper from LG and the testing at ERO Sports are lacking any high yaw data, so it is possible that the Course doesn't fare as well in crosswind situations as the Attack's smooth shape does. Overall, though, the Course is an amazing helmet that we recommend highly. ATC has them in stock now, so try it out yourself. The helmet is available in three sizes and in red, white, or black. i agree w/ the results based on my field aerodynamic testing that the LG course helmet had a lower CdA than my air attack w/ out glasses and w/ out visor. Glad i got the same results as this study on my own. The helmet did vent better than the giro, but it was not as comfortable for me. LG Course Aero Road Helmet Stealth Aero!